In a winter landscape, figures promenade, skate and one woman takes a tumble on a frozen river that runs through a village. Although his oeuvre has long been obscured by misattributions, Jacob Grimmer was one of the most important landscapists of the latter half of the 16th century, excelling in the painting series of the Seasons. 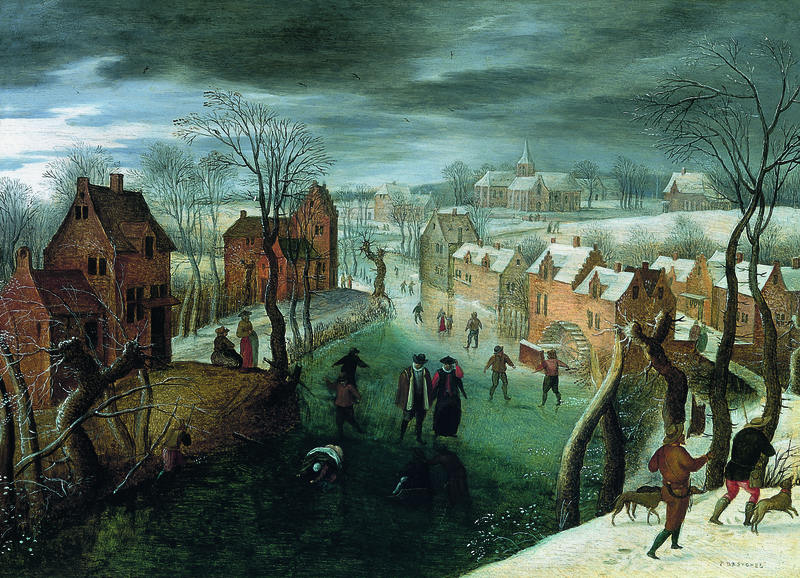 Although he remained rooted in the tradition of Weltlandschaften and an additive approach to composition in the tradition of Pieter Bruegel the Elder, Grimmer made demonstrable contributions to the rise of naturalistic landscape painting through his understanding of more coherent spatial recession and atmospheric effects. His inheritance of the encyclopaedic approach to landscape initiated by Joachim Patinir and Herri Met de Bles is still reflected in his use of a relatively high horizon line and overlapping coulisses, but the prospect retreats more continuously and the moist air envelopes his subjects more than in his predecessors' art. Grimmer's appreciation of the simple everyday life of the village and countryside owes much to Bruegel, but is unencumbered by the latter's moral and philosophical dimension. His is a charmingly direct and uncomplicated view of the world. Grimmer's art was appreciated not only by his contemporaries but also by 17th century artists. Both Pieter Lastman and his famous pupil, Rembrandt, owned landscapes by Grimmer. Rembrandt's inventory of 1656 included one of the many winter landscape by the artist. These works tend to feature a relatively high point of view with a frozen river meandering back into a landscape with overlapping forms in the lower corners of the design. Anecdotal details of rural and village life enliven the landscape. As suggested, some of these works, such as the panel of 1575 in the Szepmuveszeti Museum in Budapest, form part of an allegorical representation of the Seasons, but most are independent compositions. The present composition, as usual with Grimmer, owes its genesis to the overall design of Pieter Bruegel's Winter Landscape with a Bird-Trap (Private Collection), and in details to his famous Hunters in the Snow of 1565 (Vienna, Kunsthistoriches Museum). Although infelicities of scale (note the improbably tall ladies before the houses on the left bank) still persist in the present work, its spatial coherence is more sophisticated and consistent than that of the many Bruegel copyists and the legions of derivative painters who make up the lesser ranks of the so-called Bruegel Dynasty. Within Grimmer's oeuvre it closely resembles several undated winter scenes. The influence of the present painting and Jacob's similar winter scenes on Abel Grimmer is well illustrated in the latter's winter landscape of 1607 in the Koninklijk Museum voor Schone Kunsten, Antwerp. The attribution of the present work has been much debated. Owing to an old but specious inscription in the lower right, it was attributed to Pieter Brueghel the Younger when it was sold in 1971, 1972 and 1997. In the interim it was rightly assigned to Jacob Grimmer when sold in 1987, but as recently as 16 April 1999 when it was sold again, it carried a more generalised attribution to "School of Antwerp, circa 1600 (?)". However the cataloguers of that sale and the previous one had failed to observe that the picture appears in the 1991 catalogue raisonné by R. de Bertier de Sauvigny as by Jacob Grimmer with the figures probably by Gillis Mostaert. The rather elegant and slightly mannered staffage in the present work resemble the figures of Mostaert, who like Frans Floris and other contemporaries had a more international perspective than some Flemish masters of the period. Another version of the present work was sold as the work of Gillis Mostaert in Brussels.6 It too was inscribed with Brueghel's name and bore the mark of the Antwerp panel-maker, Michiel Classens.